The Connemara marble that is featured in this harp charm is the only natural green marble in the world; fittingly, Connemara marble is only found in Ireland. 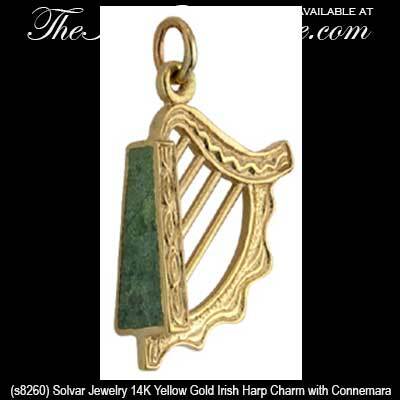 This 14K yellow gold Irish harp charm features inlaid Connemara marble and measures 1/2" wide x 7/8” tall, including the jump ring and the chain bail. The Connemara marble charm is ready to be added to your own chain or to a charm bracelet and it is gift boxed with Connemara marble and Irish harp history cards that are compliments of The Irish Gift House. 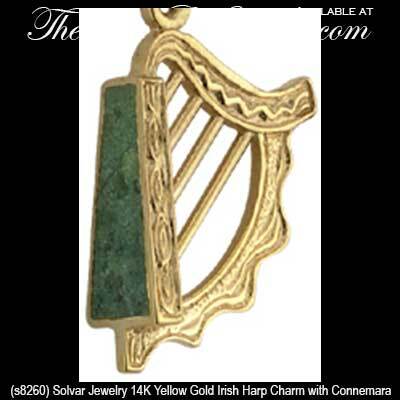 The Connemara marble harp charm is made by Solvar Jewelry in Dublin, Ireland.